“I’m scared and worried,” wrote Dennis Abrams in a column in The Houston Chronicle in July 2017. Abrams’ husband, David Fox, had just been diagnosed with early-onset dementia. Abrams wasn’t surprised. The changes he’d seen in his husband were adding up and the diagnosis was confirmation of his suspicions. After 30 years together, they knew they needed to make plans to make Fox’s life easier and Abrams’ manageable—it was time to find long-term care for his spouse. Little did they know that they had less than a year from the diagnosis before Fox would pass away. The transition from spouse or partner to primary caregiver can often be gradual. It’s not hard at first to help with taking medications, keeping doctor appointments and providing meals and a safe place to live. But as the person’s condition deteriorates, the tasks become more frequent, intense, and demanding. Caregiving becomes a full-time role, regardless of other commitments or needs. No scenario is ideal, but it’s best when planning for long-term care begins before placement is needed, preferably when the ailing person can still participate in the decision-making. This is when there’s time to have conversations to consider finances, weigh the pros and cons of available facilities, and clear up unsettled issues. After an extensive search, in March 2018, the couple found a small affordable senior care facility operated by a husband-and-wife team, both registered nurses. Unfortunately, Fox soon began to develop medical issues. He died of a heart attack a few months later. You’re not getting enough sleep. How often is your loved one waking in the night? Every time he or she wakes, you do as well. Not getting enough sleep can affect your physical and mental health. Perpetual exhaustion can make it hard to perform everyday tasks and make seemingly simple decisions, and it can cause accidents. The medications are unmanageable. On average, older adults in the U.S. can take up to five prescription drugs at a time, and this may increase, depending on the severity of the illnesses. Medications have different requirements and timing to ensure they are effective; some must be taken on a full stomach, some on empty, some are taken at night, others in the morning. The instructions can become overwhelming. If your spouse or partner resists taking medications or has serious side effects, this task can become even more difficult. You cannot physically manage anymore. 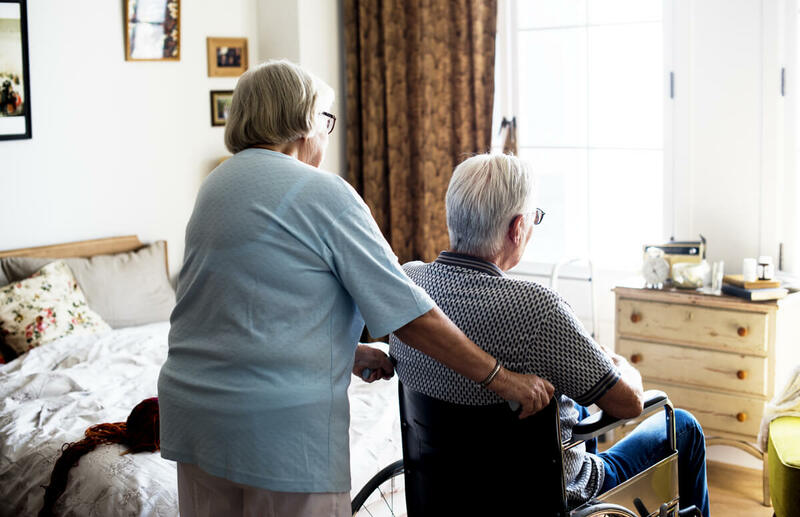 Physical care can range from tasks of daily living, such as helping your loved one eat or with toileting, to lifting him or her in and out of bed — or off the floor after a fall. Without help or with only part-time in-home help, this can become dangerous for both of you. Deciding to place a spouse or partner in a long-term care facility or skilled nursing home can be tough enough, but when adult children aren’t on board, it can be even more challenging. Ginger Houghton, a clinical social worker/therapist in Bloomfield Hills, MI, says that adult children who may be hesitant about moving a parent often feel that way because they don’t understand the full impact of their parent’s illness. If the disagreements seem beyond resolving, a professional may be the next step. A therapist, care manager, or social worker who specializes in aging can help guide the family through different resources available. Bethesda’s Care Management program is a great resource for families in the St. Louis area. Our team of senior care professionals will evaluate your loved one’s condition, connect you with other medical and financial resources, and help have the difficult conversations with family members. If you are a family caregiver, seeking long-term care for your senior loved one, Bethesda can help. Our senior living communities across the greater St. Louis area offer a wide range of living options and senior care services. Contact us today to learn more about our Long-Term Care options or our Care Management program, which can help you plan for the future with your senior loved one. By Marijke Vroomen Durning for Next Avenue.